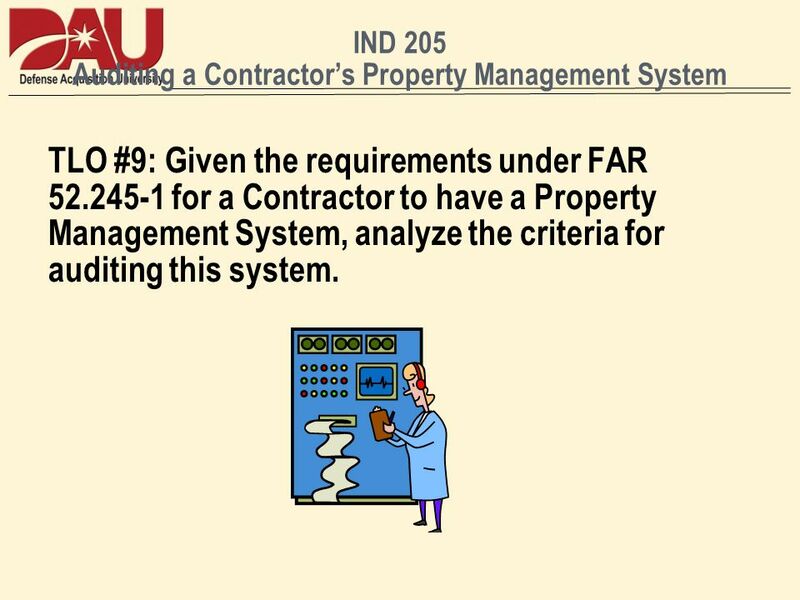 2 IND 205 Auditing a Contractors Property Management System TLO #9: Given the requirements under FAR 52.245-1 for a Contractor to have a Property Management System, analyze the criteria for auditing this system. 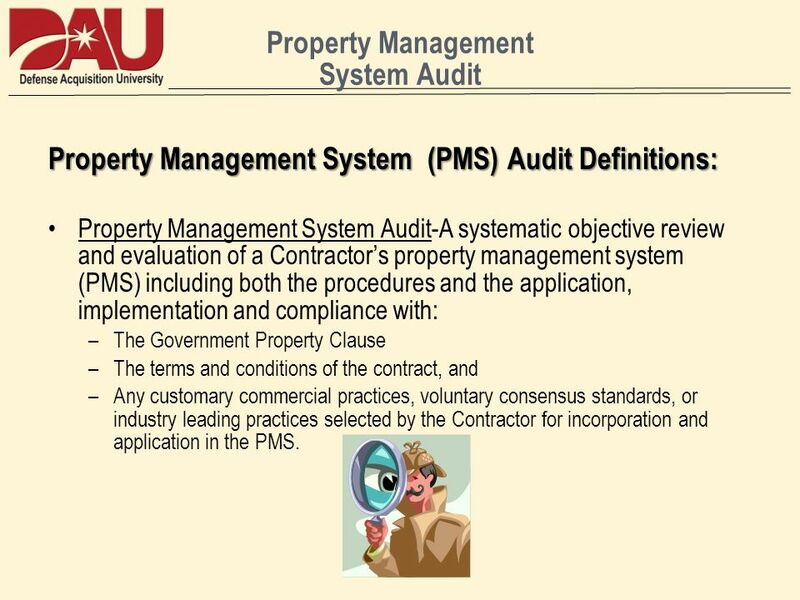 3 IND 205 Auditing a Contractors Property Management System ELOs: 1. Define audit. 2. Define analysis. 3. Define assessment. 4. 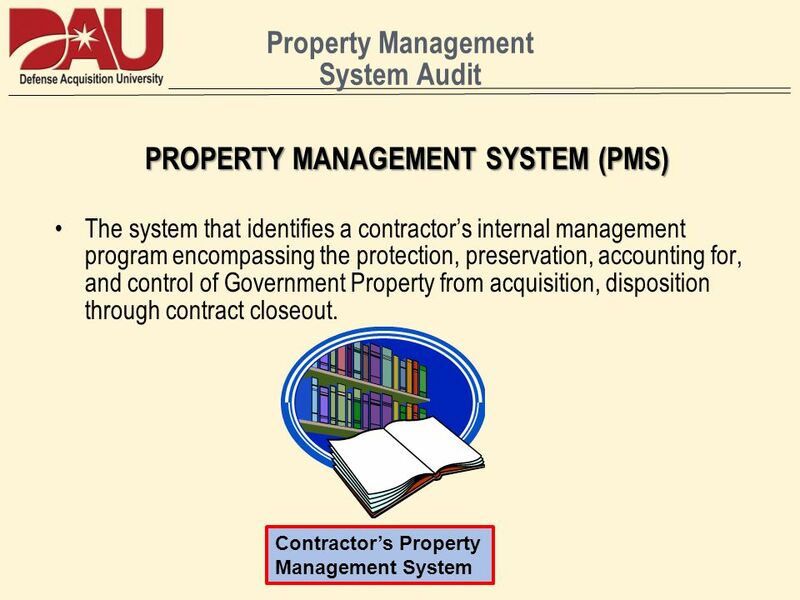 Describe the requirements for a Property Management System (PMS). 5. Discuss the references requiring the Property Administrator (PA) to perform a PMS audit. (Note: Outcomes/Processes and FAR 52.245-1) 6. 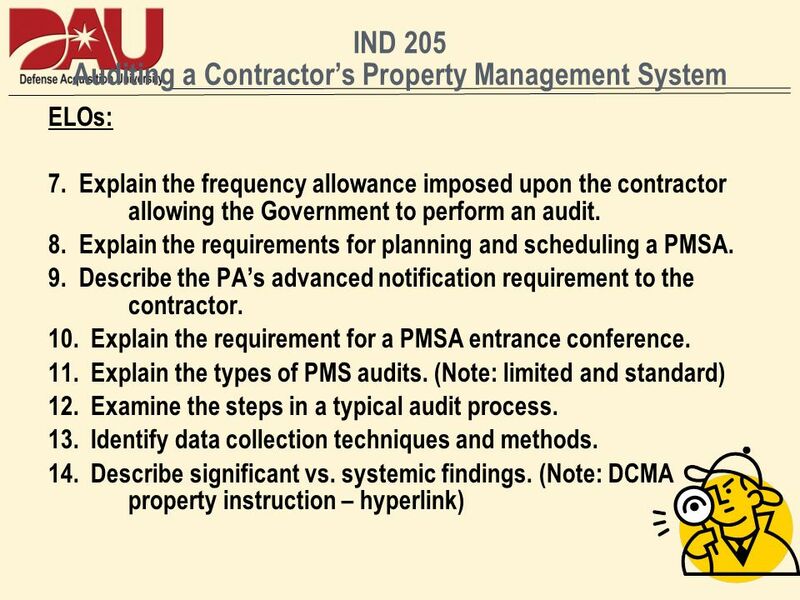 Explain the frequency requirement imposed upon the Government for performing a Property Management System Audit (PMSA). 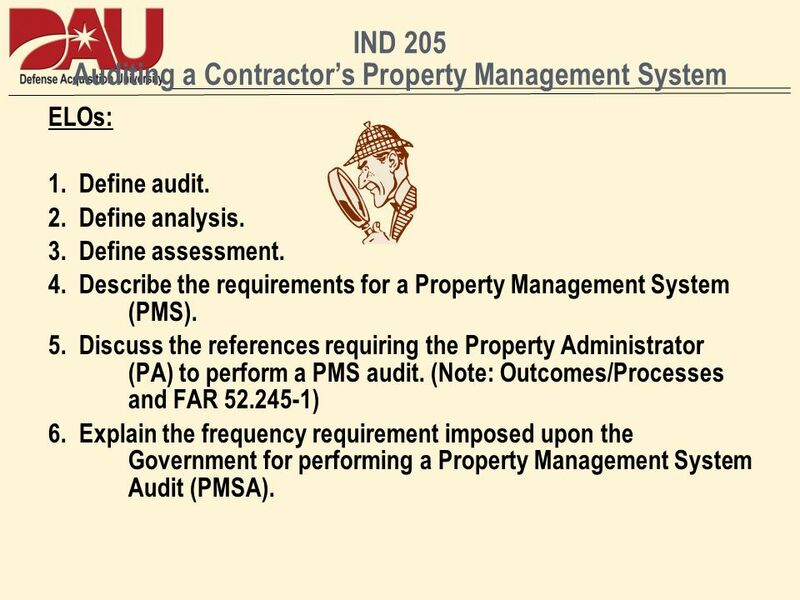 5 IND 205 Auditing a Contractors Property Management System ELOs: 15. Describe the two DFARS statuses of a PMSA. (Note: approved and disapproved) 16. Describe the reporting requirements for a PMSA. (Note: IAW the Business System Rule) 17. Describe the distribution of a PMSA summary. (Note: IAW the Business System Rule.) 18. Discuss the information that a Contractor should include in their Corrective Action Plan. (Note: IAW the Business System Rule.) 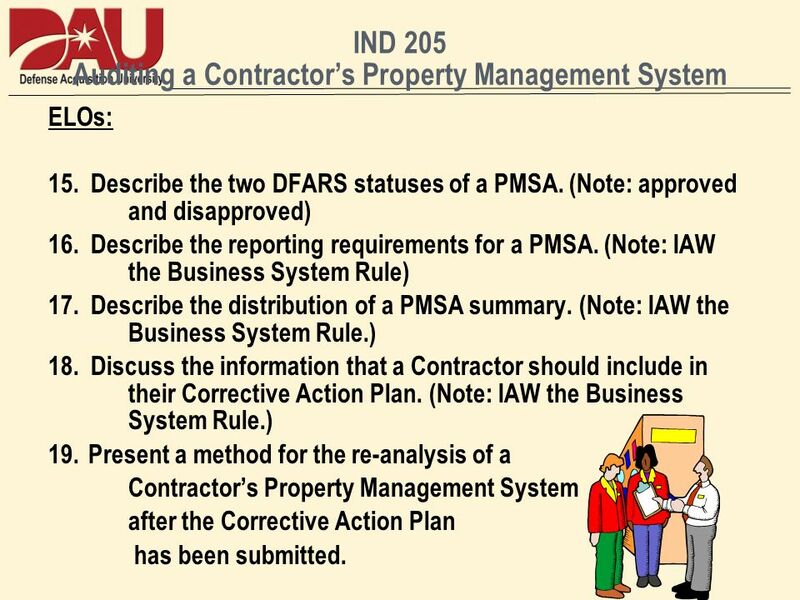 19.Present a method for the re-analysis of a Contractors Property Management System after the Corrective Action Plan has been submitted. 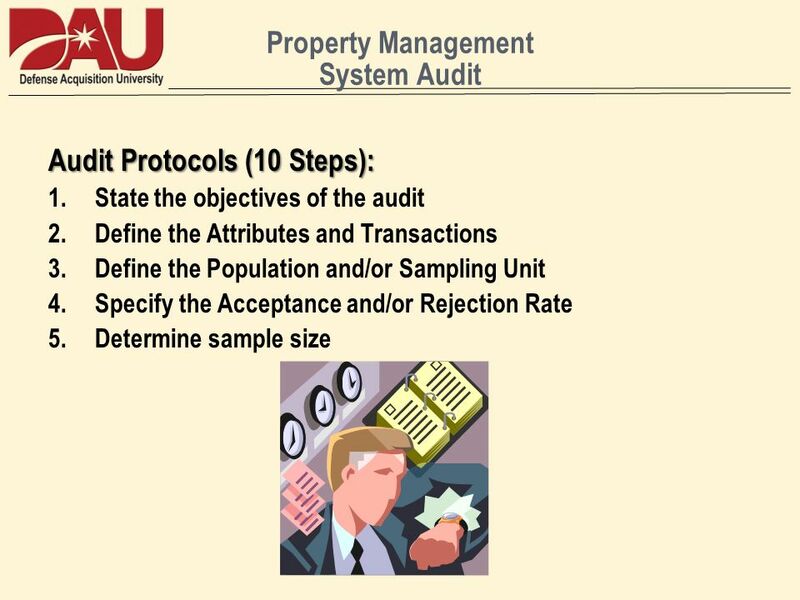 6 Property Management System Audit Property Management System (PMS) Audit Definitions: Property Management System Audit-A systematic objective review and evaluation of a Contractors property management system (PMS) including both the procedures and the application, implementation and compliance with: –The Government Property Clause –The terms and conditions of the contract, and –Any customary commercial practices, voluntary consensus standards, or industry leading practices selected by the Contractor for incorporation and application in the PMS. 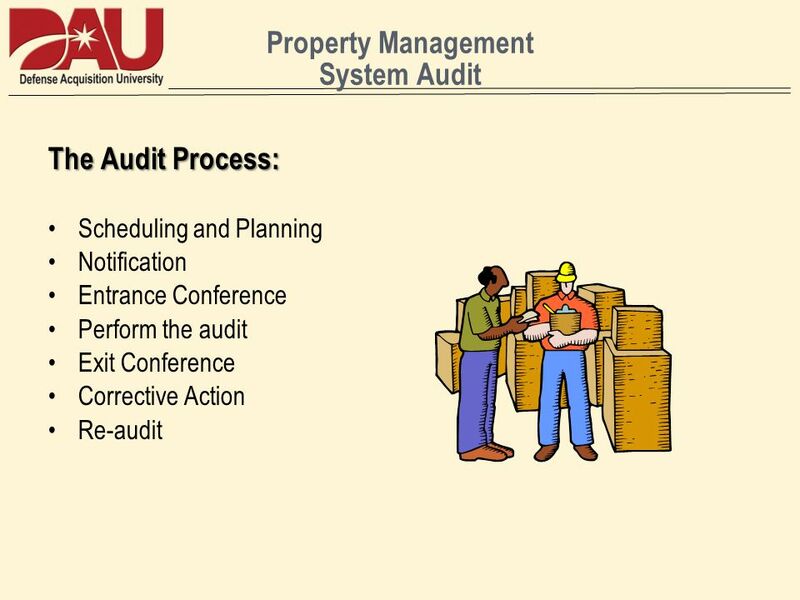 8 Property Management System Audit Standard Audit-A systematic review in accordance with GAGAS of the Contractors PMS where all applicable Outcomes/Processes, Process Segments, and Criteria are reviewed. 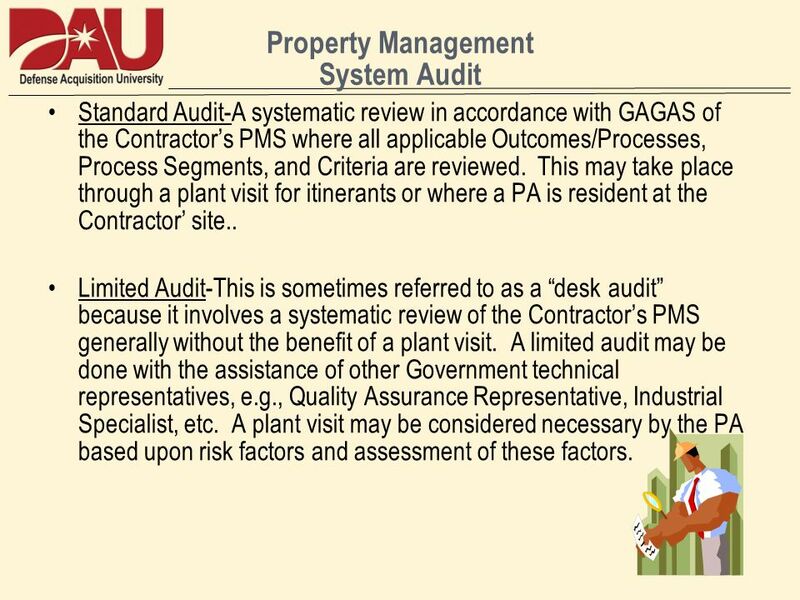 This may take place through a plant visit for itinerants or where a PA is resident at the Contractor site.. Limited Audit-This is sometimes referred to as a desk audit because it involves a systematic review of the Contractors PMS generally without the benefit of a plant visit. A limited audit may be done with the assistance of other Government technical representatives, e.g., Quality Assurance Representative, Industrial Specialist, etc. A plant visit may be considered necessary by the PA based upon risk factors and assessment of these factors. 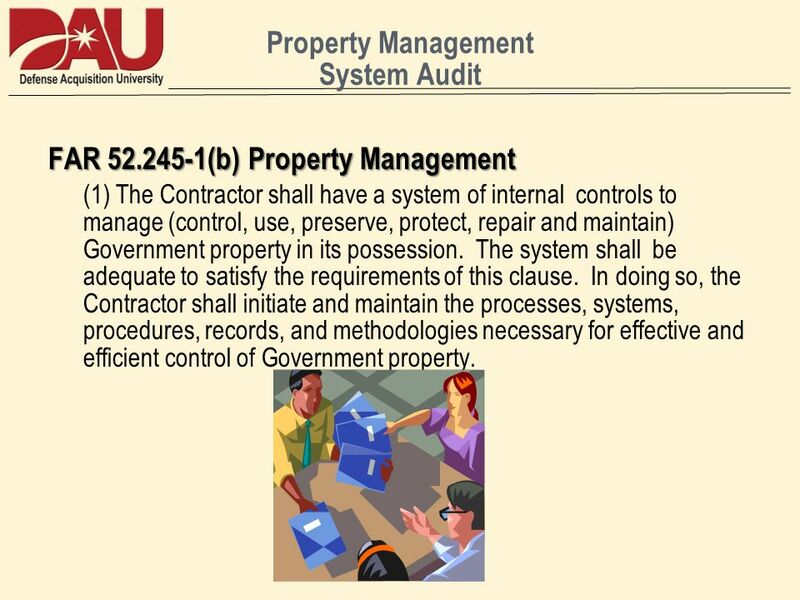 9 Property Management System Audit FAR 52.245-1(b) Property Management (1) The Contractor shall have a system of internal controls to manage (control, use, preserve, protect, repair and maintain) Government property in its possession. The system shall be adequate to satisfy the requirements of this clause. In doing so, the Contractor shall initiate and maintain the processes, systems, procedures, records, and methodologies necessary for effective and efficient control of Government property. 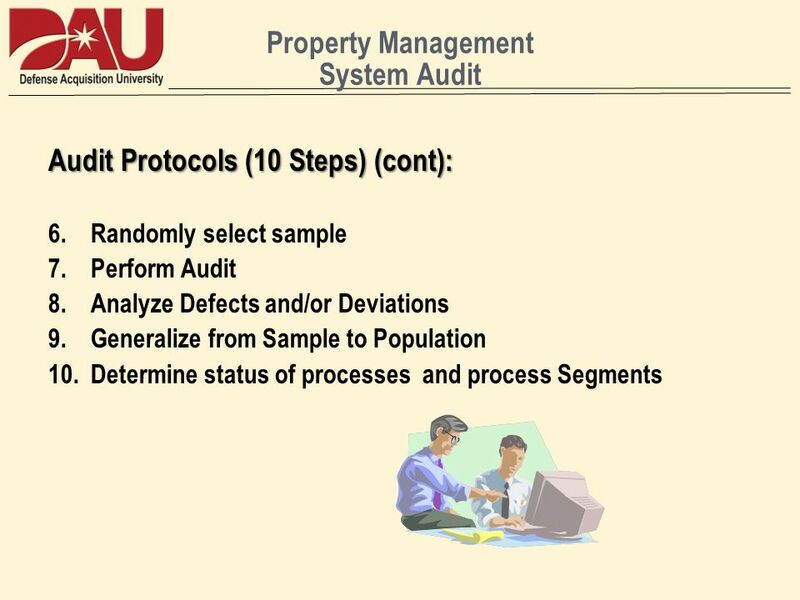 10 Property Management System Audit The written procedures serve as a standard of performance for the Contractors processes, systems, procedures, records, and methodologies. Contractor employees are expected work to this standard. 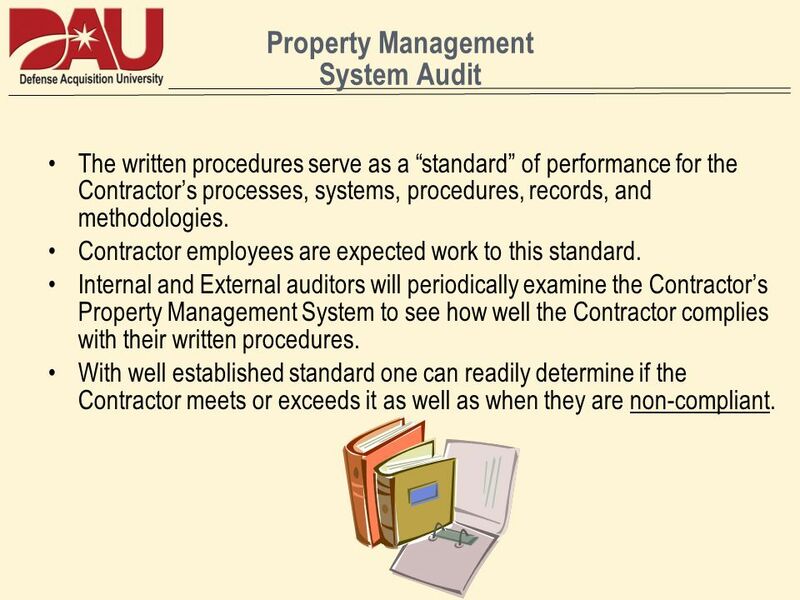 Internal and External auditors will periodically examine the Contractors Property Management System to see how well the Contractor complies with their written procedures. With well established standard one can readily determine if the Contractor meets or exceeds it as well as when they are non-compliant. 11 52.245-1(g) Systems analysis (1) The Government shall have access to the contractor's premises and all Government property, at reasonable times, for the purposes of reviewing, inspecting and evaluating the Contractor's property management plan(s), systems, procedures, records, and supporting documentation that pertains to Government property. This access includes all site locations and, with the Contractors consent, all subcontractor premises. 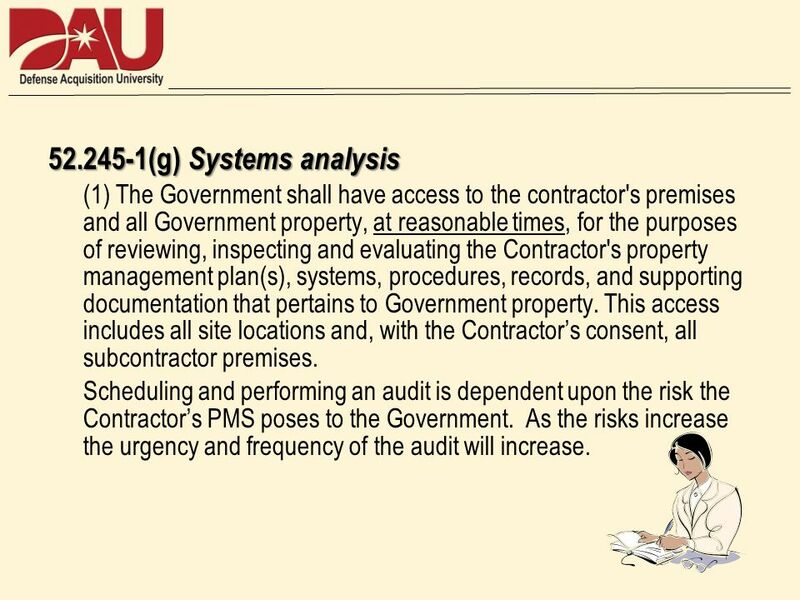 Scheduling and performing an audit is dependent upon the risk the Contractors PMS poses to the Government. As the risks increase the urgency and frequency of the audit will increase. 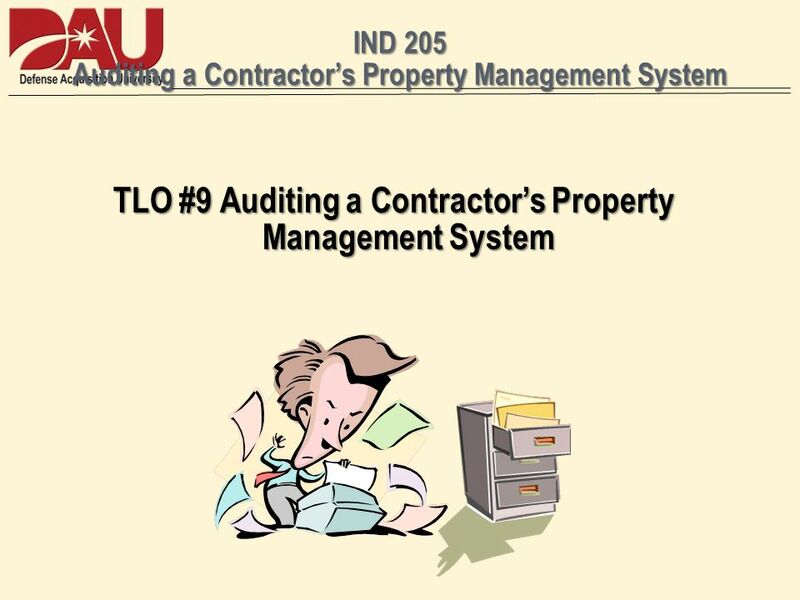 Download ppt "IND 205 Auditing a Contractors Property Management System TLO #9 Auditing a Contractors Property Management System." 1. International Module – 503 Noise: Measurement & Its Effects Day 5.